SNAP Gallery, having never looked better since its move from 104th St., and now with new Director Katherine Thompson on helm, shows Munster artist Jorg Rothenpieler's meticulous investigations of the wonders around him. Printmaking continues to be a mystery to those wary of its stern intensity and gruelling labour process. The prints usually reveal a familiar world, but the art lies in the process of those lines and shadows. 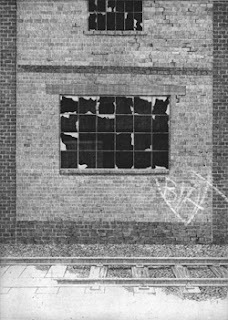 Rothenpieler's focus on the abstract resonance of urban construction gives plenty to the atmospheric grade of printmaking. Able to give ordinary brick walls a mood that we may only see at a certain time in a certain light, to engrain an emotion to a snapshot of reality, the illusion comes across rather humbly and humbling. I have not yet seen this exhibit. I enjoy the photo of Patterson that is in the latest Snaplines Newletter! April 26, 2007 at 7:07 a.m. I think you'd really like it, a lot of the shots made me think of that walk down the alley(s) we took a few sundays ago. April 26, 2007 at 8:52 a.m.
Will SNAP get the boot now that the Red Strap is closing down? Or perhaps the Dead Strap could be resurrected as a artist run centre with loads of space? May 3, 2007 at 11:28 a.m. I think it's being turned into condos, the red strap is. yeah, I wonder what's happening with SNAP. if they were smart, they would keep some space for artists, what else does the neighborhood have going for itself? May 3, 2007 at 3:24 p.m.
print workshops, community outreach programs, and rentals of our print shop. for the future of the arts in this city. May 7, 2007 at 1:14 p.m.
May 23, 2007 at 9:36 p.m. There are no plans to turns the Red Strap into condos. Its operation has simply been losing too much money for too long. May 31, 2007 at 4:18 p.m.
Red Strap, Schmed Schtrap... If not condos, what's going in that building, then, Anony? June 5, 2007 at 11:13 p.m.